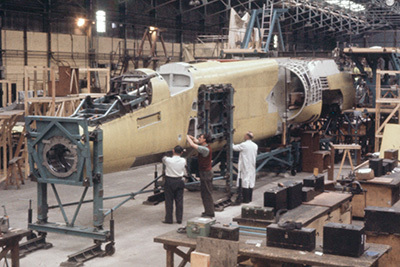 The story begins in 1956 when serious consideration of a Canberra replacement began at English Electric, in cooperation with the Ministry of Supply. At the time the MoS wanted a small, fast, strike-fighter. Official thoughts turned to developing the P.1B (soon to become the Lightning) but English Electric preferred an all-new aircraft. Studies began on both ideas, and by a month later clearer requirements were also forthcoming. 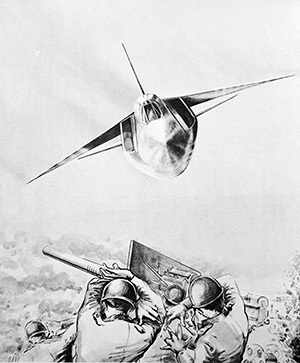 What was wanted was an aircraft with a 2,000 nautical mile [ferry] range, capable of Mach 1.5 at altitude, able to carry a variety of weapons and reconaissance equipment, attack at very low level, and perhaps with vertical or short take-off capability. 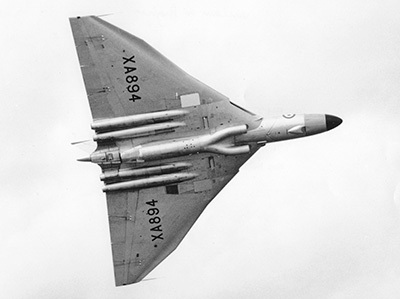 English Electric had been working on a design designated the P.17, and this moved on from their initial layout (basically straight wings with podded engines hanging off them) to being a delta wing design with engines buried in the rear fuselage. Discussions began in the MoS and the RAF. Soon more specific requirements were made available - a crew of two was required, at least four and preferably six 1,000lb bombs were to be carried, and more emphasis was put on low-level performance and short take-off runs, with a preference for vertical take-off. The developed P.1B, the P.18, fell by the wayside as it was not proving to be a viable proposition. Around this time a report on the supply of military aircraft was issued by the House of Commons Select Comittee on Estimates. It included recommendations to limit the number of aerospace companies by forcing them to band together to win contracts. This was the beginning of the end for the majority of the famous British aircraft manufacturers. Meanwhile, the air staff were drawing up General Operational Requirement (GOR) 339 to cover a Canberra replacement, and finished it days before Duncan Sandys, the Minister of Defence, announced in the infamous 1957 Defence White Paper that manned aircraft were effectively obsolete and the only aircraft the RAF would need in the foreseeable future would be the nuclear-armed V-force and fighters to protect the V-force airfields. GOR.339 was then the subject of much debate before it was finally issued to various companies in late September with the condition that only firms that joined together would be given the contract. Of the various submissions to GOR.339, only those from English Electric (with Shorts) and Vickers-Armstrongs were really viable. Shorts Brothers' outlandish idea was for the English Electric P.17A to be joined by the P.17D, a lifting platform with no fewer than 56 jet engines which would lift off vertically and from which the P.17A would then launch. Understandably this idea did not come to fruition! Over the course of the year the requirement was refined, reissued, renamed and renumbered - first OR.339 then OR.343. 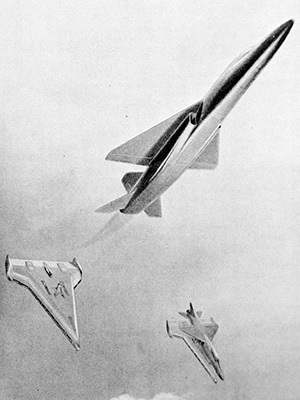 Now operation from semi-prepared strips was mentioned along with higher speed, longer range, higher altitude, shorter take-off run... the straight-forward Canberra replacement was rapidly becoming the stuff of science fiction, plus the MoS wanted the new aircraft to fulfill every role the Canberra was undertaking, including reconaissance. The MoS had decided Vickers Armstrongs and English Electric and would be awarded the contract - but only if they banded together to produce a joint design. 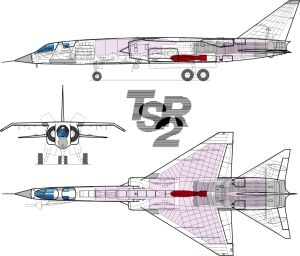 The public acknowledgement of the new project was made on 1st January 1959 when the name of "TSR/2" was first used (standing for Tactical Strike and Reconaissance, Mach 2). Blackburn Aircraft had also submitted to GOR.339, offering their Buccaneer, but the RAF were not interested. The idea of settling for the Buccaneer had a lot of merit; developing a completely new aircraft was obviously going to cost much more than modifying an existing one. However, the RAF would have none of this - they had nothing but contempt for this naval aircraft, and inter-service cooperation was a concept far removed from their minds. Indeed they would make efforts to sabotage the navy's acquisition of the type, and make significant enemies in the process. Over the next few years Blackburn would submit a number of improved Buccaneer variants, but they were always rejected. 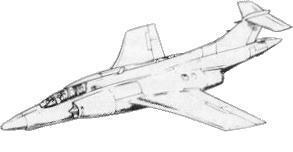 Blackburn's P.150 design (which appeared some years later in 1968) was a proposed supersonic Buccaneer with Spey engines with reheat, new TSR2 style intakes, longer fuselage, thinner non-folding wings and twin mainwheels. It gives some idea of how Blackburn may have proceeded had their been any interest in their GOR.339 proposals. Despite this lack of interest, the Buccaneer would return to haunt the TSR2 project later on. Progress continued within Vickers and English Electric to combining the two company's designs to form a single design that could satisfy OR.343. By July 1959 they had submitted their new design (which, visually at least, bore noticeable resemblance to English Electric's P.17A) despite worries about the restrictive aspects of the specification and incomplete design work. Agreement on work-sharing had been reached, though no detailed arrangements were in place. First flight was scheduled for March 1963 with introduction into service by January 1966. While the contract had been expected by late 1959, it was not actually awarded until October 1960, a year late. The delays had begun even before the first part was manufactured, hardly a good omen. In the meantime the British Aircraft Corporation had been formed (on the 1st of January 1960); with the formation of Hawker-Siddeley as a single entity a few years later (it was already around as a group of companies in 1960), much of the British aviation industry would be contained within one of two groups, BAC and Hawker-Siddeley. The government had looked at American methods of project management and development, and while finally admitting that the American's methods were superior to traditional British methods, they make a complete mess of implementing these improved methods. To all intents and purposes it appeared that the government's version threw away all the good points and kept the bad - the new, more 'efficient' management techniques would soon turn into the most bloated and inefficient bureaucracy ever seen in the aviation industry. One celebrated incident occurred when a meeting was called and the meeting's chairman decided that far too many people had turned up. He cleared the room and asked for only essential personnel to turn up for the second attempt at the meeting. When the reconvened meeting arrived, and the essential personnel had trooped in, it was found that there were actually more people present than in the first meeting. Design and manufacture proceeded despite these problems and despite poor cooperation between the constituents of BAC, the Ministry of Aviation and the various sub-contractors - most of whom were not working for BAC, but were working for the Ministry instead, with communication problems being a result. The Ministry's interference extended into the design and manufacture of the aircraft itself; they took charge of the cockpit layout, and often had three hour meetings to decide the location of a single switch (and often got it wrong). Compare that arrangement with the Vulcan cockpit design, where the chief test pilot, Roly Falk, fought for and got permission to design the cockpit himself; after all, who better to decide the layout than a pilot? Other forces were gathering against the TSR2. The Americans' TFX programme had begun, and the Admiralty were still keen to see the Buccaneer purchased by the RAF. BAC had been having talks with the Australians and had high expectations of an export order for the TSR2. By this time Lord Louis Mountbatten, the First Sea Lord, had became famous within the industry for his opposition to the TSR2 and strong support of the Buccaneer. Mountbatten said his piece to the Australians; the Ministry of Aviation failed to announce a firm order for the RAF; the Americans offered a cut-price deal on the TFX. As a result, in October 1963 the TSR2's export prospects disappeared - the Australians had chosen to buy the TFX instead. That this would cost more than four times more than they had been told and would be 10 years late into service was not something they expected. Engine development problems had also surfaced. 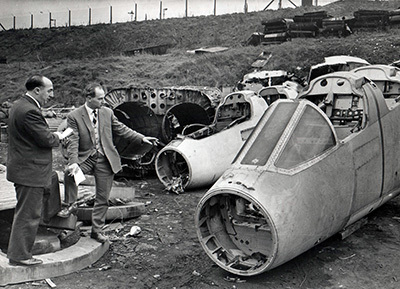 The Bristol-Siddeley Olympus engines were an all-new development and suffered various problems, which resulted in the destruction of a Vulcan testbed aircraft on the ground, putting back the first flight of the TSR2 as a result. With the first aircraft now complete, it was transported by road to Boscombe Down. Vickers had wanted test flying to begin at their airfield at Wisley, but the chief test pilot, Roland Beamont, objected to this because of the shorter runway there. English Electric's airfield at Warton would have been ideal, but the Ministry of Aviation forced the firm to use Boscombe Down instead. This meant more delays; neither company had a base of operations there, and the aircraft had to be reassembled at Boscombe over a period of a month. On the 6th of May 1964 the fully assembled first development batch aircraft, XR219, was removed from its hangar at Boscombe Down to begin testing, including taxi trials. Various minor problems occurred, including the failure of the braking parachute to deploy on one fast taxi run, but most were overcome. The cause of the engine problems was finally identified in September, only days before the TSR2 was due to fly, and the engines then in the aircraft were vulnerable to the same issues. However, with pressure on the project increasing all the time, it was decided to go ahead with the first flight. A general election was looming, and a change of government was widely expected. Obviously BAC hoped that presenting the new government with a flying aircraft would put some firmer foundations under the troubled project. The final decision was down to BAC's chief test pilot; Roland Beamont. Despite the engine problems (they could have blown up if too much time was spent beyond 98% power), despite many items of equipment not being ready and despite expected problems with the undercarriage and braking parachute, he decided the flight should go ahead; he was prepared to accept the risk for a single flight. Had an engine failed on this first flight, the remaining one would have had to have been run at maximum, and that could have been disastrous. On the 27th of September, the first flight was duly made, with Roland Beamont - callsign Tarnish 1 - as pilot and Donald Bowen as navigator. XR219 flew and performed generally as it had been expected to. Beamont summed up the flight as 'a very good start'. However, XR219 at this point was in no way representative of an operational version; with limitations on engine power, many missing systems (to hurry up the first flight) and no attempt made to retract the undercarriage (a complicated affair made necessary by the lack of room in which to place it and the rough field requirements in the specification). After that first flight no more flights were carried out until the end of the year, by which time the engine problems were beginning to be overcome, though flight tests then proceeded slower than they could have because of remaining niggles with the undercarriage and engines. The engines were not the relatively clean engines of present-day jets. Each engine produced thick black smoke, which, with the TSR2's distinctive wingtip contrails, meant that it was not hard to spot a TSR2 in the air! Other problems continued also. Serious vibration problems related to the undercarriage meant that at the instant of landing, the crew were violently thrown around. Further serious vibrations at certain throttle settings were also intolerable, with the vibration being at the resonant frequency of the human eyeball thus causing loss of vision to the pilot. This was finally traced to a faulty fuel pump. Undercarriage problems were not limited to vibration; there were also sustained problems with hydraulics and sequencing. Malfunctions varied from doors refusing to close to more serious problems like one leg staying extended while the others had retracted correctly. On one occasion the undercarriage came down but the main bogies did not lock into the correct position. Nothing could be done to get the gear down correctly, so Beamont told his navigator, Don Bowen, that it could be time to leave by Martin Baker (i.e. eject). The boffins on the ground, however, thought that a safe landing could be made if the descent rate was very low. Beamont and Bowen bravely elected to stay with the aircraft and try to land it. In the event, the landing was successful, the bogies rotating into the correct position as the aircraft settled onto the extended gear. Finally, on flight number 10, after four months of attempts to fix the problems, the undercarriage was successfully retracted. 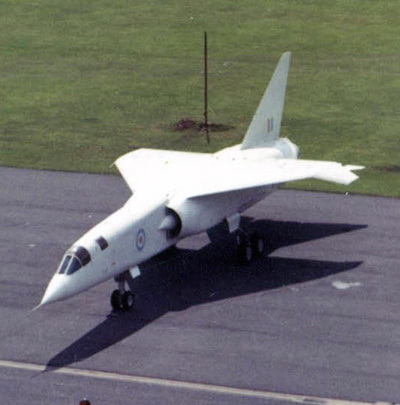 Beamont soon decided that XR219 was ready to continue its flight test programme at Warton. 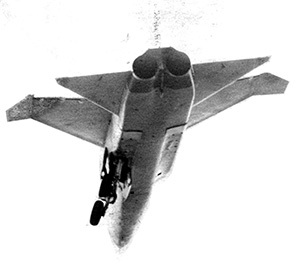 Flight 14 was XR219's trip to Warton, during which it went supersonic for the first - and only - time. 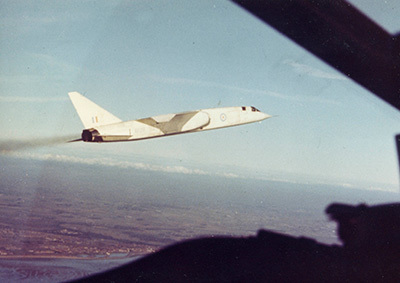 The TSR2 was taken smoothly through to Mach 1.12 with one engine in reheat, briefly leaving the Lightning chase aircraft behind until it engaged reheat to catch up. The TSR2 programme was, however, now under serious and concerted attack; poor management and inter-company cooperation had caused spiralling costs and rumours abounded of impending cancellation. 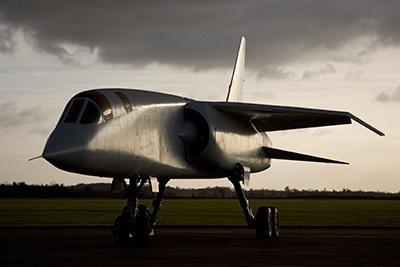 In early 1965 the national newspapers reported that an RAF team was in the USA to consider purchasing the TFX (F-111) instead of continuing the TSR2 programme - despite Labour promises to aviation industry workers that 'Your jobs are safe under Labour'. Urgent discussions between BAC and the new Labour government ensued, and there was even a protest march in London where 10,000 BAC and Hawker-Siddeley employees demonstrated against cuts in the industry. The government issued such strong denials of cancellation that The Times quipped that they had 'struck fear into the heart' of the industry. The problem was simply the money the TSR2 was soaking up - the aircraft's development costs had gone up time and time again, and the entire programme had been continually under threat nearly from day one. Labour believed the TFX could be a cheaper alternative, and that they could re-deploy aviation workers to 'more productive' work. Meanwhile, XR220, the second aircraft, had undergone inspection and repairs after being damaged on delivery to Boscombe Down (it had literally fallen off a lorry! ), and was ready to fly for the beginning of April after repeatedly delayed delivery of flight-capable engines. That the aircraft was incredibly advanced was not in question; and the problems besetting development were being solved one by one. But the specification was continually being downgraded to allow BAC to meet it, and the RAF was getting ever colder feet. All of the hard work would be to no avail. 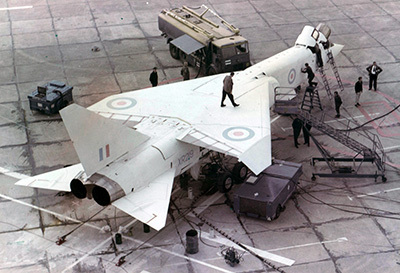 XR220 would never fly; the government, in the Budget Day announcement on the 6th of April 1965, announced that the TSR2 programme was to be terminated immediately. The aircrew were at the time having lunch near Boscombe Down; on hearing the shocking announcement they rushed back to the airfield in an attempt to get XR220 into the air and to at least present the government with a second flying aircraft. This was not to be; permission was denied. While the management of BAC were informed before the budget speech was made, they were forbidden to tell their employees, who then had to hear the news on the radio. The House of Commons was in uproar over the cancellation; but no debate could take place during the budget speech so not only had the government treated BAC's workforce with contempt, they had tried to slip a major defence project cancellation past the opposition. A debate one week later in the house was a rough ride for Denis Healey (the new Minister of Defence), who tried to justify the cancellation on the basis that the F-111 could be bought more cheaply, though he could not state a real cost or exact timescale for the buy. Whatever happened from now, redundancies in the UK aviation industry were inevitable. XR219, XR221 and XR223 were eventually taken to the shooting range at Shoeburyness, all to be destroyed as 'damage to aircraft' targets. XR220 was kept at Boscombe for a year or so for engine noise testing and then placed in storage at RAF Henlow for the nascent RAF Museum after it had much of its flight test equipment ripped out (even the wires were cut rather than disconnected). It was later transferred to RAF Cosford's Aerospace Museum and remains there to this day. XR222 was gifted to the College of Aeronautics at Cranfield for instructional use. She was later donated to the Imperial War Museum at Duxford. All the other airframes were eventually scrapped though many components were held onto for research purposes. Within around a year of cancellation, the jigs had been disposed of, a wooden mockup of the TSR2 was burned (while BAC men filmed it for publicity purposes). With good photographic and film coverage of the airframe scrapping and mockup burning, BAC made sure that the cancellation would never be forgotten, leading to years of exaggerated stories of the project's destruction. Cancelled in the months before were Hawker-Siddeley's two major projects; a new transport aircraft, the HS.681, and the P.1154 tactical strike fighter (the 'supersonic Harrier'). The P.1154 had also been victim of the infighting between the Navy and the Air Force, but some good was to come of these two cancellations. The P.1127, a less ambitious project, was allowed to proceed. This became the Harrier, a world-beating VTOL light strike aircraft and fighter which has since been developed into a number of versions for countries around the world, including the UK, the USA, India and Italy. The P.1154 itself was replaced by the US-made F-4 Phantom, though re-engined with British Spey engines. Problems with the Spey and Phantom marriage meant that not only were British Phantoms the most expensive of all, but they also performed nowhere near as well as the original US models. The TFX programme continued in the US; but when it too became massively expensive and development ran into major problems, the UK (and the US Navy) cancelled their orders. Britain was to pay hugely for the TSR2 cancellation; not only in the waste of the TSR2 development, but now in cancellation fees to General Dynamics. An attempt to produce a swing-wing aircraft of our own in cooperation with the French (the AFVG) ended in failure too. 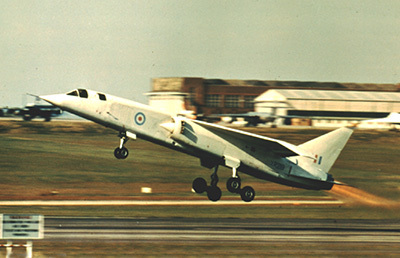 BAC survived the TSR2 cancellation; the only other major project not cancelled was the Anglo-French Concorde supersonic transport, which while never being a massive commercial success, gave BAC valuable experience and prestige both with advanced aircraft and with international cooperation. The SEPECAT Jaguar, near enough a 'baby TSR2', gave them even more experience of this kind of cooperation, and produced a useful strike aircraft, though it did not compare with the TSR2. Following soon after came the MRCA (Multi Role Combat Aircraft, or, more cynically, Must Replace Canberra AGAIN!) project, a truly European project, which despite its detractors produced another world-beater - the Panavia Tornado. Strangely, in 1979, there was a brief attempt to revive the TSR2 programme, with a private company looking at possible modifications to bring it up to date (square intakes with variable ramps like Concorde, modern electronics, Olympus 593 engines as per Concorde and so on) and badgering government and RAF departments with letters about resurrecting the aircraft. As they suggested using XR220 and XR222 as prototypes for this 'new' TSR2 and the Tornado was not far away from flying, it was frankly no wonder that this idea went nowhere. As it turned out, the Tornado eventually became more or less what the TSR2 was to have been. That it was still slightly less capable in some areas than the TSR2 had been projected to be a full fifteen years earlier says a great deal about how ambitious the TSR2 specification really was, and just why the project turned into such an expensive monster. That the TSR2 was all-British (bar some electronics) and the Tornado required the cooperation of three countries also says a great deal. TSR2 would not have been perfect - but it still could have been a world-beater - if we could have afforded to make it so. Final specification called for carriage of 2 x WE177A/B nuclear weapons, up to 10 x 1,000lb HE bombs, rocket pods, 2 x Martel missiles or a reconnaissance pack. Two 30,610lb (22,000lb dry) Bristol-Siddeley Olympus B.O1.22R turbojets. * This is not a genuine total in the usual sense and consists of the development batch airframes (9), static test airframes (2) and pre-production airframes (11). At the time of cancellation, there was one flyer, one ready to fly, two more practically complete and the rest in various stages of construction. Of the two static test airframes, one was complete and in use, and the second was nearly complete. Eleven more airframes were to follow in the pre-production batch, but progress on these was mostly limited to rear fuselages - and even these were not actually complete when cancellation came.